Case Institute of Technology awarded Leutner the honorary Doctor of Humane Letters, 1948. 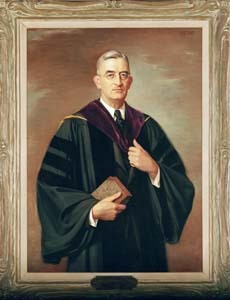 Western Reserve University awarded Leutner the honorary Doctor of Laws, 1950. The Emily Payne Smith Leutner Memorial Fund was established by President Leutner and family and friends in memory of President Leutner’s wife. The fund was renamed in 1962 the Winfred George and Emily Payne Smith Leutner Memorial Fund. The fund was used to purchase books in the arts and sciences for the University Library, 1955. Western Reserve University dedicated the north side dining and recreation commons the Winfred George Leutner Commons, “because he upheld the finest traditions of academic freedom, because of his kindly and sympathetic relations with faculty and students,” 1965. Continuous Campaign was launched. It included annual gifts, capital gifts, and bequests, and continued throughout Leutner\x92s tenure. The School of Nursing was renamed the Frances Payne Bolton School of Nursing of Western Reserve University. The Faculties of Arts and Sciences was established. Composed of members of the Adelbert, Mather, and Graduate School faculties, it acted on matters of common interest. Countries around the world were plunged into World War II. Corporate reorganization amalgamated the separate corporations of Western Reserve University, Case Library, Adelbert College, and Cleveland School of Architecture into a single corporation. Cleveland College was amalgamated with this corporation in 1942. The Plant Rehabilitation Fund Campaign was intended to raise $300,000 to replace, repair, and renovate facilities. The campaign, which raised $134,000, was abandoned after the attack on Pearl Harbor. GI Bill of Rights (formally: The Servicemen\x92s Readjustment Act of 1944) was signed into law. The School of Education was closed. The Department of Education operated until 1979. 1947 First telecast was made by WEWS, Ohio\x92s first television station. The School of Pharmacy was closed.